Geisha Play and traditional Japanese Kaiseki Cuisine Tour in Tokyo. Have traditional Kaiseki Cuisine for lunch or dinner with Geisha in a private room. 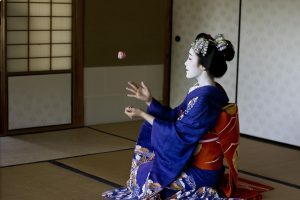 Play traditional Ozashiki-asobi with geishas. Born in Nagano prefecture where Snow Monkey is famous. Studied in the United States for two years and have visited 30 countries. Taught students English for over 20 years before started a professional tour guide, a government-licensed guide. Have a husband, two daughters and a grandson. Hiring a guide in a country you have never visited makes you feel free from anxiety. I’ll tailor your tour in a way you would like. If you don’t have any ideas, I can offer you a recommendation. You’ll be confident how to use subways and railways in Tokyo after the tour. You’ll have a splendid and unforgettable experience! Thank you for the kind words that you expressed in your email. Meeting and spending time with you was a thoroughly enjoyable experience for us too! We feel truly blessed to have had such a fabulous guide as you throughout our first day in Tokyo. Not only did we receive a fantastic introduction to Japan, but we also feel fortunate to have gotten to know you personally. Thank you for sharing so much with us about Japanese customs and also about yourself & your family. You will be happy to hear that thanks to you, Theb was able to lead us in effectively navigating the train system throughout our time in Tokyo! Due to all the kindness that you extended to us, we all had a truly unforgettable experience in your country; already we are trying to figure out when we can visit there again. We feel that we have made a wonderful new friend in you–and sincerely hope that you & your family can come to Hawaii soon. We would be delighted to serve as hosts in showing you the lovely sights (and foods) of the islands! We cannot thank you enough, Toyo, for all the Aloha that you showed us during our visit!